The 2013 Garden City Stakes takes place this Saturday, September 14, 2013 at Belmont Park in Elmont, New York. This Grade 1 event is open to 3 year-old fillies and is raced on the turf over a distance of 1 1/8 mile (9 furlongs) with a purse of $500,000. First run in 1978 as the Garden City Handicap for older mares, the following year it was limited to three-year-old fillies and named the Rare Perfume Handicap in honor of George Widener’s racing mare, Rare Perfume. In 1998 the race was renamed for Garden City, New York, a village in the Town of Hempstead in central Nassau County located near the racetrack. There are some fantastic fillies lined up for the starting gate come Saturday to run in the weeds. Let’s take a look at my top three picks. 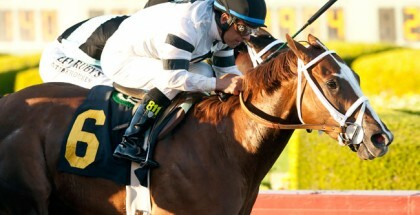 ~Kari on pretty filly Emollient in the 2013 Garden City Stakes. Emollient, the 3-year-old daughter of Empire Maker became a (GI) winner in her first try on turf when she blew out the American Oaks this summer. 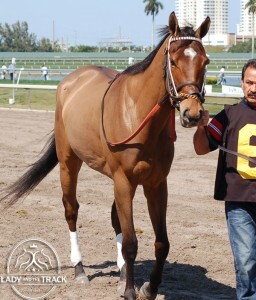 Prior to that all of her races were on dirt of synthetics so we’ll see if this is really her niche on the grass. Emollient recently warmed up for the 1 1/8-mile race on Sept. 8 by breezing six furlongs in 1:14.12 on the inner Belmont turf. This will be Emollient’s first time out after her triumph as the favorite in the American Oaks on July 13 at Betfair Hollywood Park. 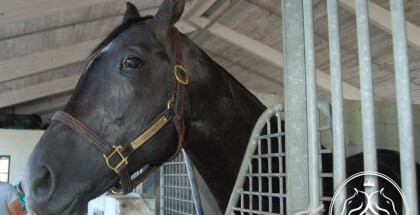 She will be seeking her second win on the turf here Saturday and it will be interesting to see how this plays out. Emollient gets post #1 with M. Smith for the ride again. The Patricia Generazio homebred Discreet Cat filly, Discreet Marq, brings a three-race winning streak into Saturday’s Garden City Stakes. The Christophe Clement trained New York gal flew west to earn her first (GI) victory in the Del Mar Oaks at Del Mar, California on August 17, 2013. This pretty gray rising star on the turf won the Sands Point (GII) on the Belmont inner turf on May 27th, 2013 and looks to go head to head for favoritism with Emollient. Discreet Marq has hit the board 8 of 10 races in her career. With “Go-Go” G.Gomez in the saddle, Discreet Marq leaves from post #2. Another filly I like in this spot to score is the Chad Brown trained Diamond Green baby Whatsdachances. Last out Whatsdachances finished second in the (GII) Woodford Reserve Lake Placid Stakes at Saratoga on August 18, 2013. Prior to that, she came in second again at Saratoga in the Lake George Stakes (GII) on July 24. On May 27, 2013 she was third here at Belmont in the Sands Point Stakes (GII). Last year she was second in the Breeders’ Cup Juvenile Fillies Turf (GI) behind winner Flotilla. Of a nine career racing history, Whatsdachances has hit the board eight times and I’m looking for her to strike here again. She exits from post #10 with J. Castellano up in the irons. This is going to be one tough race with some super fillies in here which makes it hard to pick just three. Last out Discreet Marq was figured to set the pace in the Del Mar Oaks but instead stalked pace setter Wishing Gate before pulling ahead to win. I like her in the two spot and I really like Gomez up here. It will be interesting to see who sets the pace here and how this race plays out as both Emollient and Discreet Marq can stalk or run up front. I really like Emollient to hit the board but I’m not keen on her getting the one hole. So for the 2013 Garden City Stakes I’m going with Discreet Marq for the win, followed by Emollient and Whatsdachances to hit the board. Good luck to all of the ladies and their connections. Safe ride! The 2013 Garden City Stakes is race #9 at Belmont and set to post at 5:17 PM EDT. Newbie Handicapper Fun Fact: On horseracing forms female horses from the age of two-four are classified as a filly, designated by an F. This changes to M when they become five and are officially called a mare. For males, they are called colts from two-four with the designated C. If they are a “whole” horse, uncastrated, this changes to H when they are five and called a horse. For Geldings, castrated, it’s the G and for Ridglings, undescended testicles, R, they both carry that from age two until they retire. The Garden City Stakes takes place at beautiful Belmont Park on Saturday, September 14, 2013. Post time is approximately 5:17 PM EDT. 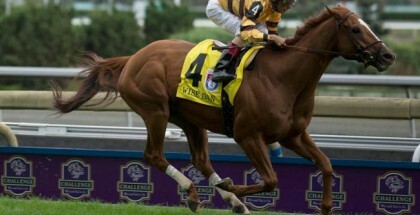 2013 Ricoh Woodbine Mile; Can Wise Dan Be Beat?